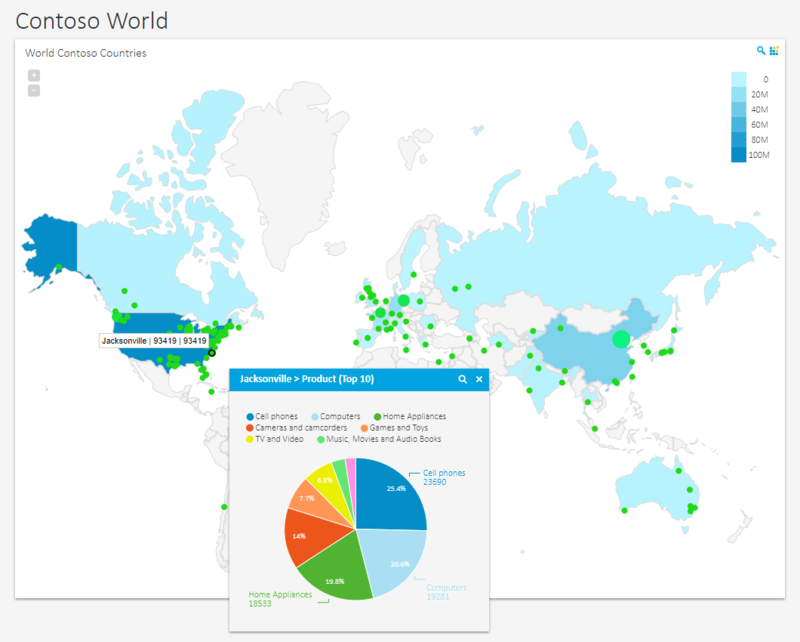 Discover dashboard analytic options to explore your data, find in-depth insights and quick answers to your data related questions. Connect to your data analytic models, which could be existing OLAP database or Analytic Model created in Kyubit application based on your SQL or CSV file data. Once there is multidimensional analytic data to on the dashboard, users can select different analytic approaches to further explore and analyze data with analytic dashboard features available that are available to all dashboard users using real-time data from your data sources. An interactive analytic dashboard is easily shared by the authorized users, exported to PDF or available on mobile devices. Multidimensional data models provide simple and intuitive data analytics using multidimensional structures in the form of measures and dimensions, which simplifies user interaction and answering data analytic questions. 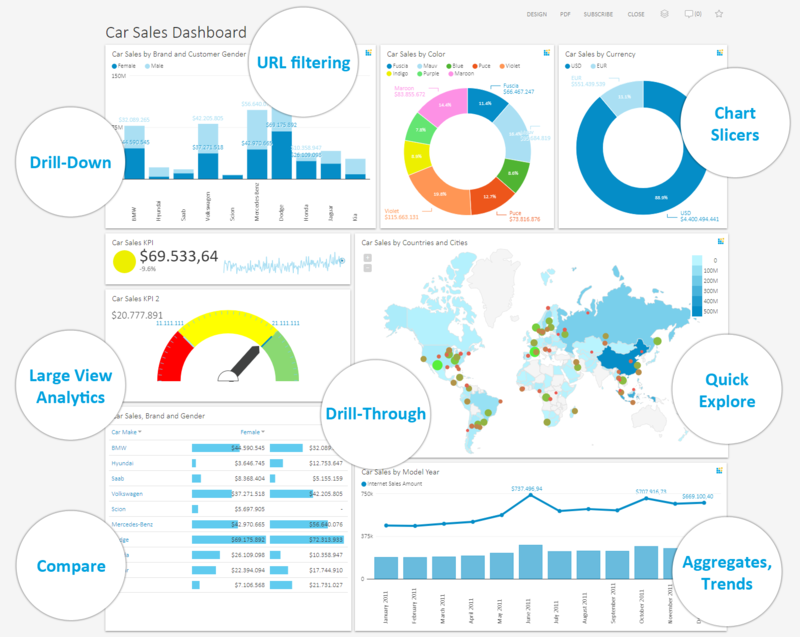 After initial dashboard data is visualized, Analytic Dashboard is used to resolve further questions related to displayed data, discover changes, patterns, measure success and find reasons for current performance. Get details on the chart segment click. Define dimension that will be used for 'Quick Explore' dashboard chart analytics. When a user clicks on the chart segment (column, point, region) small window will be displayed that additionally breaks-down values of the selected segment by used dimension. For example, when a user clicks on 'Jacksonville' city, 'Quick Explore' window will pop-up showing Jacksonville sales data by the products. Same could be applied for any measure and using various charts. 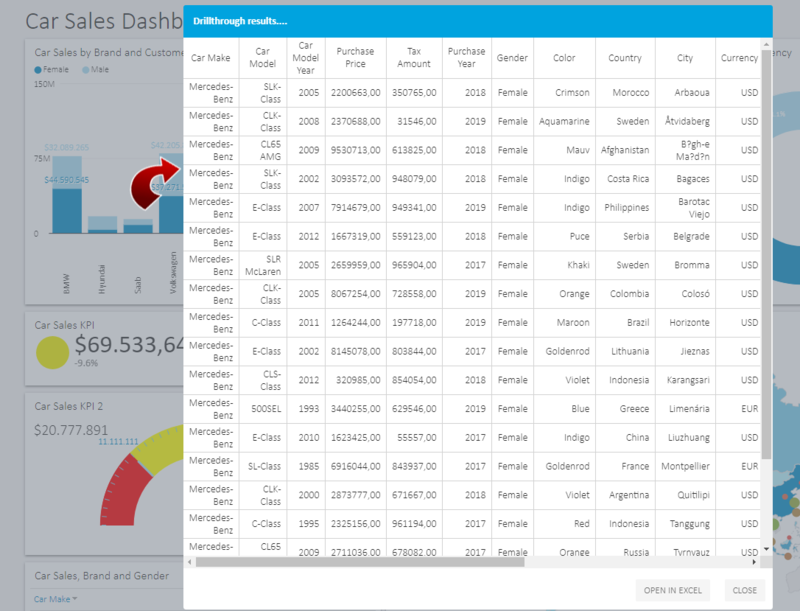 It is a great quick insight analytics dashboard feature end-user will appreciate having. 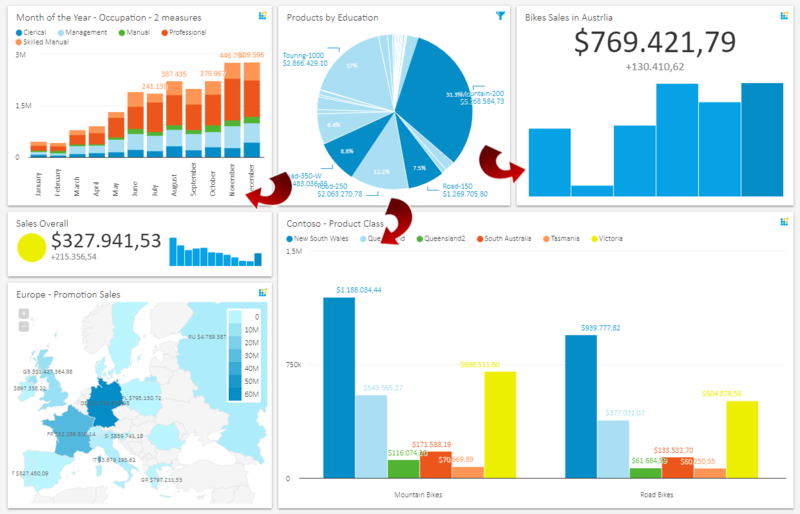 'Quick Explore' dimension and chart type could be defined in analytics dashboard design-time or production time by the end-user. 'Quick Explore' chart could be further drilled-down to a particular dimension or displayed as an enlarged chart in full screen. Select a chart on the dashboard to act as a slicer for other charts. Instead of selecting filters to slice dashboard charts, set some convenient chart to act as a slicer, which means that as soon as you select any segment of slicer chart, it will be automatically added to filters and by which the whole dashboard will be used to slice. 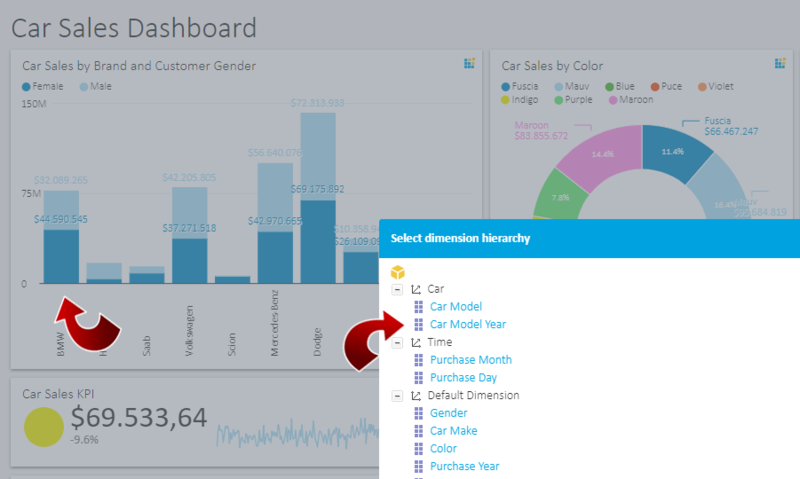 Very appropriate analytics dashboard feature for quick slicing of the dashboard data. Slicer charts are enabled and disabled by the end-user while at any time. It can be used on any chart based on multidimensional data (OLAP cubes or Analytic Models created in Kyubit BI application). Most common analytics on the dashboard chart is to use 'Drill-Down' action which splits current value to be displayed in smaller segments, using any of available dimensions. Right click on the chart segment displays a list of actions available for the data. Selecting 'Drill-Down' will bring the selection of the dimension that will be used for a drill-down operation. For example, sales on some product could be quickly drill-down to months and later specific product-month to a country. Multiple drill-downs are available on the same chart and getting back in the reverse direction (drill-up). After each drill-down, it is possible to change chart type that perhaps better suits give dimension data. Drill-down analytics on the dashboard is available as in-place chart analytics or first choosing the large view for the same chart, before drill-down analytics. For full analytic features, click the analysis icon which will open same chart data in full grid/chart analytics view. Slice dashboard or specific charts with selected dimension members, narrowing displayed data to the point of analytic interest. To slice analytic dashboard data, select filters and add appropriate dimension level filters from a related data source. After dashboard filters are updated only charts related to the same data source (as added filters) will be refreshed to display sliced chart data. Analytic dashboard filters could be saved during dashboard design-time or by end-users while in production. 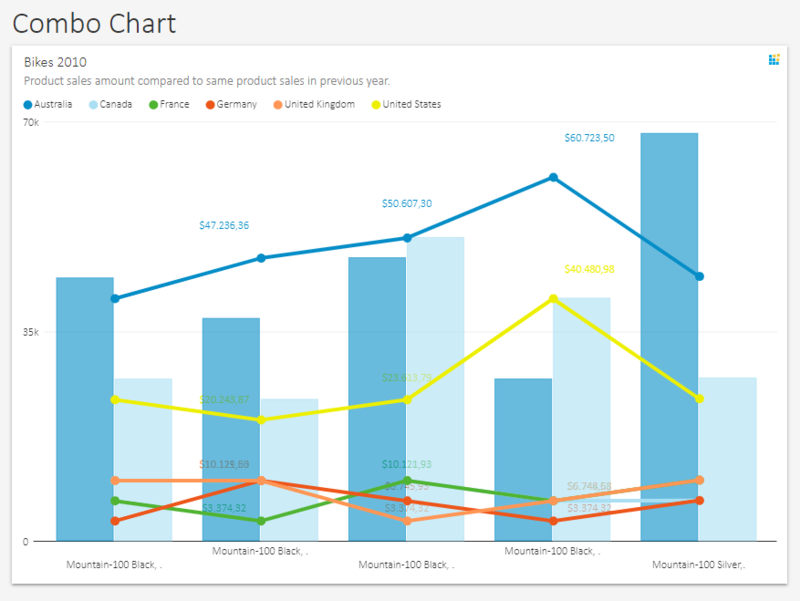 Analytic dashboard designers could explicitly select which charts will accept filters or not. 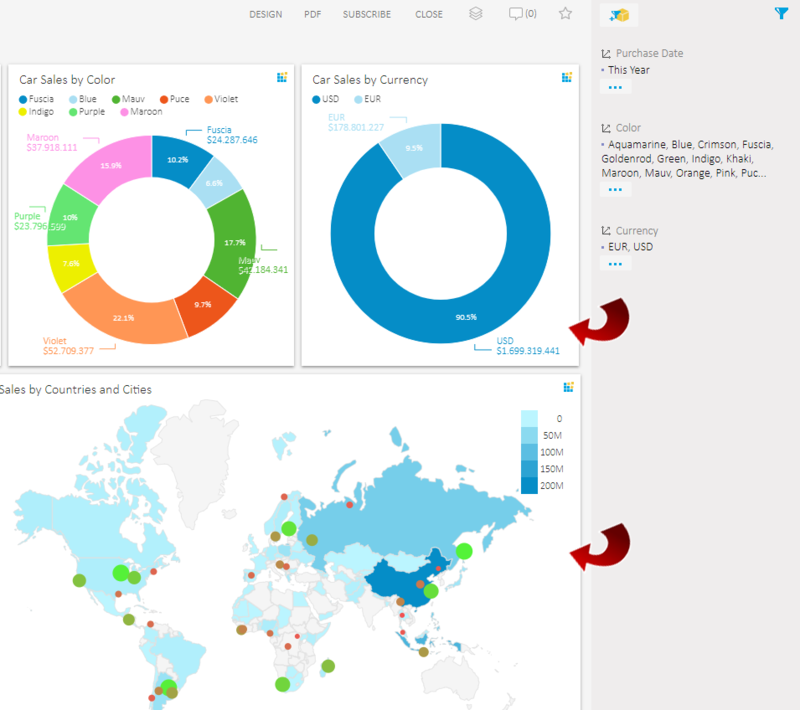 Dashboard slicers could be applied to analytic dashboard based on OLAP data or data from created 'Analytic Models' in Kyubit BI application. Use dashboard URL to add slicing filters dynamically. Especially useful when opening dashboard from external page and setting which dimension members will be used as filters in URL query string. Two datasets (analysis or query) could be compared on the same Combo chart. When two datasets share the same categories and series, but have different values and/or measures, ideally data compare could be displayed using 'Combo Chart', which will display each set of data as column or line chart and allowing easy comparison of values. Values for both sets could be displayed on the same Y-axis or each set on separate Y-axis. Get more details on particular data from the displayed chart. Select the chart segment for which you would like to discover details and a new drill-through window will open with the list of all items and properties related to the selected chart segment. It is a quick action to get details of the aggregated data displayed in the analytic dashboard chart. If data is based on OLAP cubes, available drill-through columns are defined in OLAP cube or Kyubit application. If chart data is based on 'Analytic Models' created in Kyubit BI application, all columns of data used to create 'Analytic Model' could be used for drill-through display. Download 30 days evaluation of 'Kyubit Business Intelligence' and see Dashboard features in action.